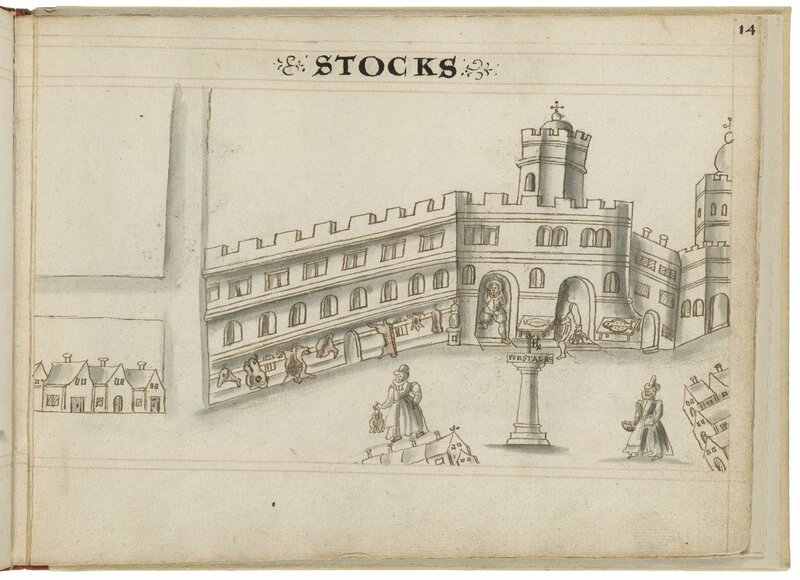 Drawing of Stocks Market by Hugh Alley. Image courtesy of the Folger Digital Image Collection. The Stocks Market was a significant market for fish and flesh in early modern London, located south of Poultry, north of Bucklersbury, and west of Walbrook Street in Cornhill Ward (Weinreb, Hibbert, Keay, and Keay 879). It is labelled as Stokes on the Agas map. The building of the Stocks Market was commissioned by lord mayor Henry le Wales in 1283 and, according to the editors of The London Encyclopedia, is named after the the only fixed pair of stocks in the city (Weinreb, Hibbert, Keay, and Keay 879). Other names include Les Stokkes and Le Stocke (Harben; BHO). According to Sugden, the Stocks Market operated as a landmark in early modern literature. He lists Sir Philip Sidney’s Remedy for Love as well as Thomas Dekker’s Bellman as texts that mention the Stocks Market as a significant site. Stocks Market no longer exists as such in modern London. It was destroyed in the Great Fire of London, rebuilt, and then replaced in 1739 by the Mansion House, which is the official residence of the Lord Mayor of London. Takeda, Joey. Stocks Market. The Map of Early Modern London, edited by Janelle Jenstad, U of Victoria, 20 Jun. 2018, mapoflondon.uvic.ca/STOC1.htm. Takeda, Joey. Stocks Market. The Map of Early Modern London. Ed. Janelle Jenstad. Victoria: University of Victoria. Accessed June 20, 2018. http://mapoflondon.uvic.ca/STOC1.htm. Takeda, J. 2018. Stocks Market. In J. Jenstad (Ed), The Map of Early Modern London. Victoria: University of Victoria. Retrieved from http://mapoflondon.uvic.ca/STOC1.htm. Sheriff of London from 1270—1271 CE. Mayor from 1273—1274 CE, 1281—1284 CE, and 1297—99 CE. Built a conduit in London.